Take Your Sound With You Everywhere! 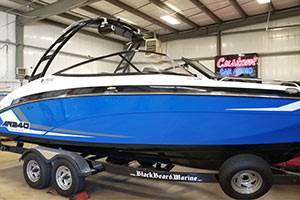 Let us install a system in your boat with WetSounds compression speakers on your tower, designed to project music 100 yards plus! 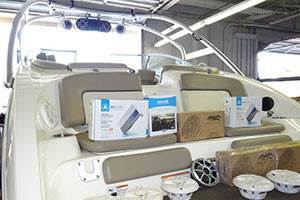 We can also install JL Audio marine components for incredible sound quality inside the boat. With LED custom lighting in your boat, we can light up walk ways, cup holders or light up the lake around your boat by adding external LEDs under the swim deck. 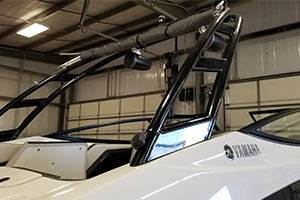 Our installation facility offers 40 foot deep installation bays, along with 12 foot high, double wide bay doors to accommodate large boats as well as any long vehicles. Take a virtual tour of our showroom! 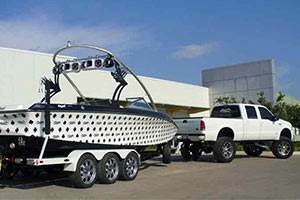 Let our expert salesmen and installers help you be the LOUDEST boat on the lake! 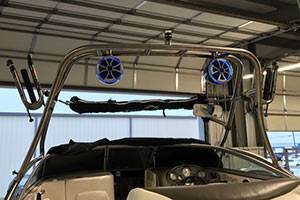 When you need to hear the music over the motor as you own the water, you need a premium set of marine tower speakers. Boat tower speakers are designed to create crystal-clear sound at high volumes that will carry across the water. Whether it’s rocking along the waves or out at the docks, these powerful speakers can handle the surf, sun, and sounds that make up any boating experience great. 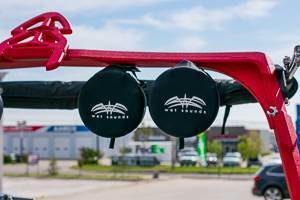 Make sure your boat has the powerful audio equipment they need to own the waves. 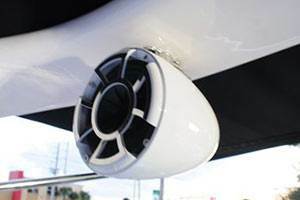 Our marine loudspeaker systems and components are specifically designed and tuned for an open-air boating environment, ensuring phenomenal fidelity at cruising speed or while anchored at your favorite swimming spot. 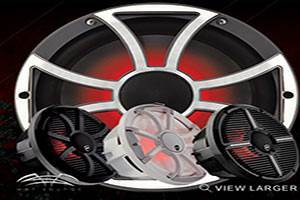 These high quality marine speakers are also designed to sound and look great for a long time. 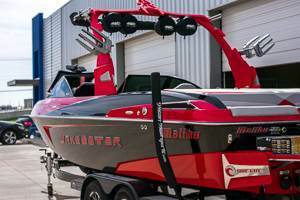 Get the marine amplifiers you need to keep their boat rocking. Our marine amps give your system the power it needs to really push your speakers to the limit, whether your hosting a boat party at the docks or catching sick air on a wakeboard. Our amps are designed to stand up to anything the water throws at them while providing crystal-clear sound. 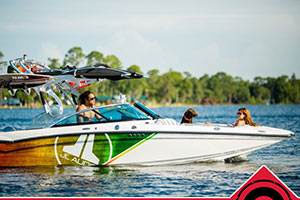 Give your friends and family more than just a boat, give them the premium boating experience! 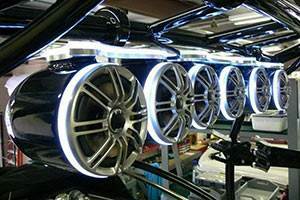 Subwoofers bring music to life! They provide an audible energetic experience that is second to none. This is especially true when paired with an awesome day out on the water! 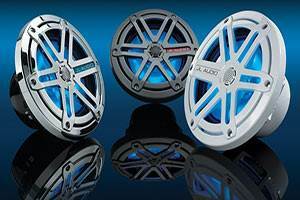 To achieve optimum bass on a boat, multiple subwoofers are often a necessity. The purpose of this is not simply to be loud, but rather to provide consistent bass output in all zones of the vessel. Our expert salesmen and installers can help you pick out the perfect radio for your boat. We love to customize a system specific to you, your boat and your expectations! 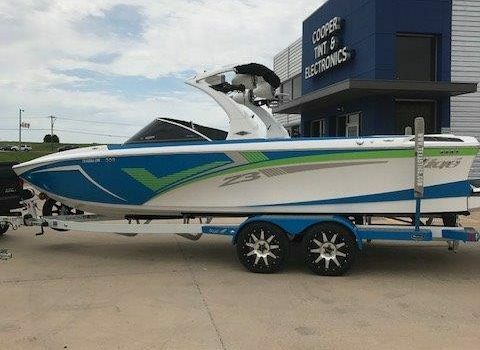 When you outfit your boat at Jackie Cooper Tint & Electronics, you get the peace of mind that comes from more than 40 years of mobile audio experience! 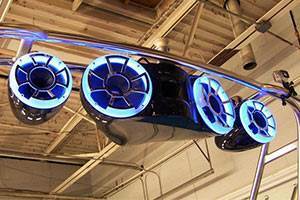 Strategically placed lighting is just another way to customize your boat and accentuate your audio. The lighting is installed making it safe to move around your boat after dark while giving it a classy, upscale and fun look! 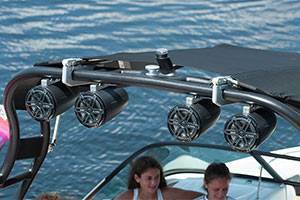 It definitely adds life to the party on your boat!! Let our experts help you design your boat lighting system!